No doubt this is a convenient and simple dish, if you are going to fix a quick dinner meal during busy working days. My family including myself loved this simple steamed dish. The tasty sauce with a hint of natural sweetness yielded from the juicy steamed pork together with the aromatic salted egg was truely appetizing. Adding of excessive cornstarch helps in creating smoother and more bouncy texture of the stemed pork. Hence, I added 2 heaping teaspoons of cornstarch instead of just 1. And due to my work, I marinated the minced pork overnight. It gave better and stronger flavour to the pork, in fact. So, don’t miss this juicy steamed pork dish next time when you are fixing a homecooked dinner! 1) Season minced pork with the listed seasoning, for at least an hour. Make sure seasoning is well combined with the minced pork. 2) Boil salted duck eggs Ina pot of boiling water, for 5 minutes, or till eggs are 90% solidified. Remove from pot, let eggs cool before peeling the shell. Coarsely mash salted eggs with bare hand or a metal fork. To mash eggs more finely, if desired, chop eggs on the chopping board (for cooked food use) with a knife. Set aside. 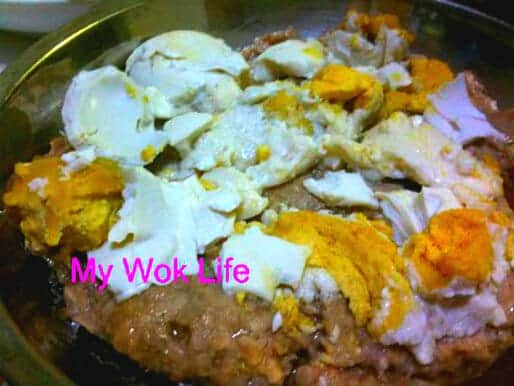 3) When ready to steam the pork dish, top mashed salted eggs on the marinated minced pork meat. Place pork dish in steamer or on the wire rack in a wok half-filled with boiling water over high heat, cover lid and steam for 10 minutes. Heat off and serve. Variation: I kept the salted egg in chunks because I would like to get more taste and have larger and firmer bites of it, just personal preference. However, if you are going tor better presentation, mince the salted eggs finely and top and cover a layer of it on the entire surface of minced meat. Alternatively, cook three eggs altogether (instead of two eggs), to make it six halves, and arrange each half with its flat side down on the surface of minced meat (I’ll show you next time when I cook this again). This way, you will have both better appearance of the dish as well as fuller bite of the salted egg (smile). A portion of my steamed salted egg minced pork counts about 250kcal. Tips: Marinate minced meat over night for even better flavour, if desired. * Use ready-to-eat salted duck eggs which easily available in major supermarkets may save up your time to do the boiling of raw eggs and for better control of egg texture. Usually those ready-to-eat types are not too hard but just soft enough for steaming purpose. Hello! Would like to ask how do you wash the minced pork before cooking? I found it so messy when i washed it, and i need to pat dry with kitchen towel/paper. Tou are right. It’s very messy to wash minced meat thoroughly. So what I did is, to just rinse it in the shape of block wuthout loosen it first, once unwrapped from the packaging.